How did you know I needed help?! 🙂 We have a b-day coming up next month and the theme is Star Wars Legos. I’ve found a cute tutorial to make a lego block cake but I was certain that I couldn’t make it look as good. My icing always ends up looks like a stormy sea. Maybe this year will be different! you seriously should come report back and let us know if the icing is stormy or clear skies! 🙂 good luck! the lego block cake sounds adorable! 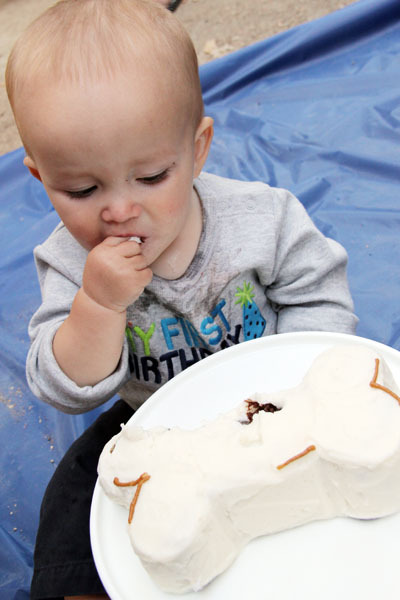 Spiderman is super cute, and I love that you made Owen a dog and bone cake. Adorable. I really think freezing helps make decorating easier. Great list of tips and tricks, Jane! 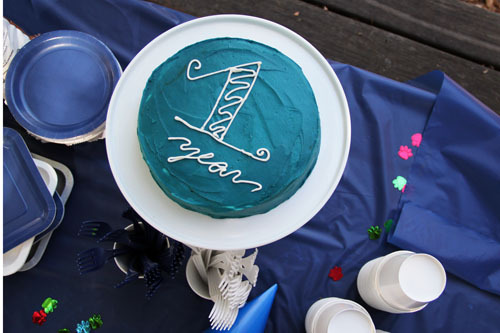 Great post – I love making kids birthday cakes! I can’t understand how the cake strips work, but I’ll definitely be trying this out. Thanks for the great tip! I make my kids cakes too. I have had great luck with the butter cream transfer, google it. There are some great you-tube videos. Works great every time and gives you endless possibilities of what can go on the cake. Then I don’t have to figure out how to carve a cake. That scares me! I have done: Curious George, Rapunzel, Iron Man, princess crowns, ninja’s… you get the idea. Do you have a guide where you got information on how to make cakes like these? 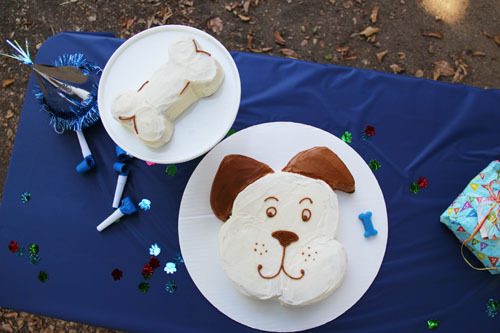 The dog cake is super cute but I need more than just a picture to work from! That book I mentioned has lots of wonderful cake shapes with templates and whatnot to show you how to build the shapes. The elephant cake I did was from that book. I would either try to get your hands on that book or just find another similar book that has ideas and templates. As for the dog, I literally just copied a dog face that was on a pair of Owen’s pajamas. 🙂 I used a 10-inch cake pan, trimmed away a few spots to shape it like a dog’s head, then I cut the ears from an 8-inch cake that I baked separately (I doubled the cake recipe and had 2 8-inch cakes and a 10-in cake to work with). The ear shapes came drom the pajamas! The face I sort of just made up on my own after looking at tons of dog face illustrations on a google image search. Finding images that you can build from a round cake is always helpful – and simple simple simple is best! For keeping buttercream white but having that extra note vanilla or almond flavoring adds – Wilton makes colorless vanilla and colorless almond extracts. You get the best of both worlds – white buttercream AND flavor! All I can say is, yep! Most of these are so true and I had to learn the hard way, because I have a hard head! The wax paper trick- awesome! Totally doing. Two stories: for my sons 1st Communion. Made the cake first thing in the morning and it literally crumbled as I iced it. Too late to bake another- shoved a bunch of strawberries as decoration and good to go. Last summer my daughter had hello kitty and I had this great idea to make HK cupcakes- easy: square marshmallow ears,jelly bean eyes, raisinette nose, piped whiskers, ribbon bow. Sounds cute huh? Then I made one and they looked awful! But my daughter LOVED them and insisted I make them all and bring them to the party. I am terrible at transforming my idea in to reality! They always love my homemade cakes and so does everyone else because they are fresh! GREAT hints!! I needed this! Can I confess that the Spiderman cake absolutely melts my heart? I remember when you posted about it originally and was just so smitten! And hearing about Owen’s excitement over seeing his cakes that you had worked so hard on was pretty heart-melting too 🙂 Overall awesome tips — I’m feeling inspired! FANTASTIC post Jane!! I pinned it! you’re welcome! such good timing! For the black lines, I purchased a tube of the black decorating frosting/gel – I think it was just at the regular grocery store. I used my start tip and buttercream frosting for the eyes. happy birthday to the cute 4 year old grandson! This summer my DIL texted to see if I remembered how I made my son’s (now her husband) 8th birthday cake becuase he wanted another one just like it for this year’s 28th birthday. The fire hat? No the swimming pool with teddy grahams. It was fun to go through the memories with them of all the cakes I had made for him all those years ago. AND I still had the picture in my cake decorating file that I used for inspiration, which I sent to her. According to his memory I only glanced at the magazine cover while waiting in line at the grocery store and went home and made it (parents are SO smart when the kids are young). She did a great job adding new flair to the cake special for him and it tasted great. So good job Jane at making the special memories for your kids. I love that story…so cute! see, those cakes stick in your brain forever!! Such cute cakes! I am trying to not use artificial coloring because of them being made with petroleum…yes, that is what red #40 is made with! Do you know anything about these Wilton gels and the ingredients? Are they made with artificial coloring? while natural food colors are often more muted, I must say that they are often very beautiful…I’ve seen other food bloggers using them and thought their stuff was really pretty. 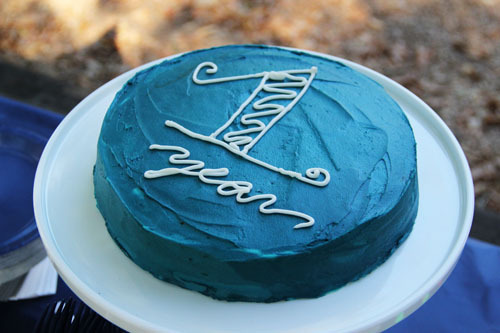 I’m super impressed – both by the cakes and the post. This is such a great post! Thanks for the tips! That spiderman cake would make my sons birthday alone! that’s a good question! just whatever cream I have on hand…whipping, light, heavy, whatevs! if I don’t have cream, milk works great, too. 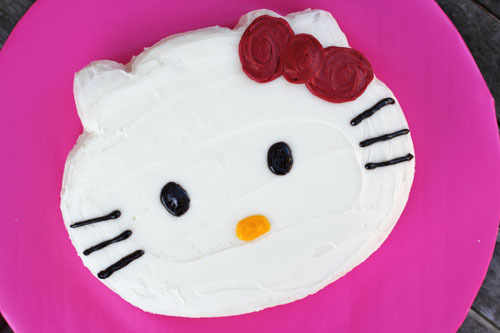 I am going to make my first “cute cake” for my 2 year olds birthday party next weekend. I am planning on decorating the cake on Friday. Would it be ok to make, color and refrigerate the frosting on Thursday? first off, what will the cake be of? so fun! yes, you can definitely make the frosting on thursday and refrigerate it. it will get quite hard in the fridge, so make sure you take it out of the fridge a couple hours (maybe even just 1 hour, but plan on 2 to be safe!) before you plan to decorate with it so that it can get back to a spreadable consistency. Lenise, all the way over in Melbourne, Australia. 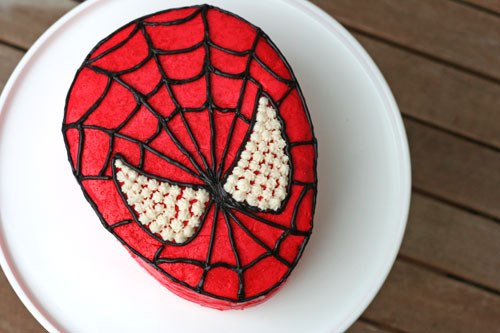 Your spiderman cake is spectacularly simple yet so spectacularly awesome. Great job Jane, thanks so much for sharing. How many cakes did you make to use for the Spider-Man cake? 1 or 2 stacked on each other? And what size? Making one this weekend for my sons 3rd birthday!! you know, I can’t remember…I THINK it was just a 1-layer cake, but it would be super easy to still make this cake and stack two cakes, then you would have more cake to serve from your one cake (if that makes sense). If you do 2-layers, I would just stack the cakes when you shape them into the spiderman head shape. yay! so glad you are making it! have fun!